The San Diego-Coronado bridge delivers you to this welcoming “European Style Café.” I’ve been here with my husband, my mom, my coffee buddy, and several friends and it’s always an enjoyable experience. There’s a walk-up counter for a cup of coffee to go if that’s what you have on your mind, but they have full service in their casual and charming restaurant. Sit inside or outside, but don’t forget to take a peek at their counter of bakery goods. I had a scrumptious pumpkin scone recently, but the lemon blueberry scone looked equally yummy. Dogs are welcome on the outside patio and they sell gourmet biscuits for your favorite canine. You’ll want to enjoy a delicious and bottomless cup of coffee and kick-back with that little home-away-from-home feeling. Their coffee is roasted by Cafe Moto. Walk a block towards the bay and voilá . . . a spectacular view of San Diego. There you’ll find the ferry to downtown San Diego. 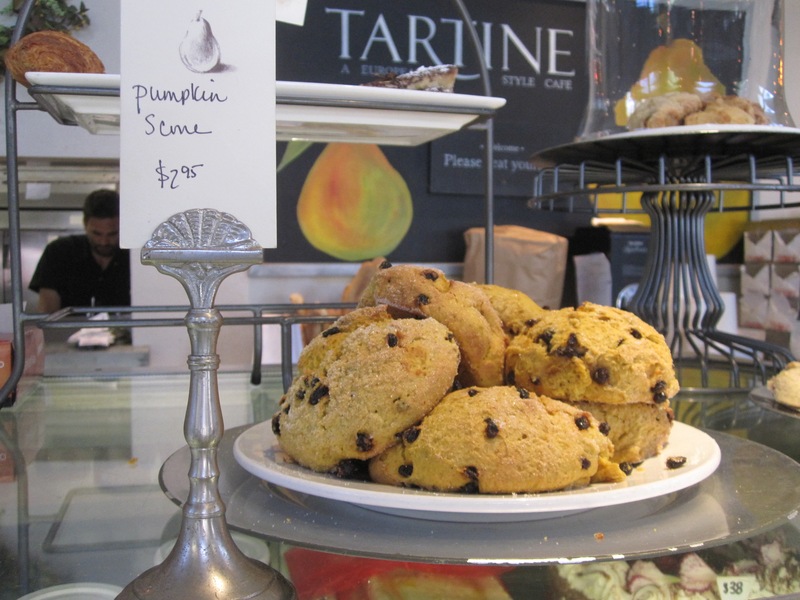 Or, if you prefer, you can take the ferry from downtown and visit Tartine. You can start out your day at Tartine, take the ferry to downtown San Diego, explore our beautiful city, and then return to Coronado (www.flagshipsd.com/cruises/coronado-ferry). Another option is to enjoy a lovely walk along the water’s edge while seeing San Diego across the bay. Staycations are made of these tiny treasures. This entry was posted in Coronado Island, near the beach and tagged Coffee, Coronado Island, scones. Bookmark the permalink.